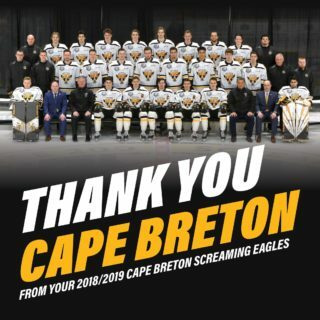 The Screaming Eagles shot early and often but couldn’t find a way to get a late tying goal in a 3-2 loss to the Acadie-Bathurst Titan in Sydney on Saturday. The Eagles outshot the Titan 55-12. The first four shots of the game went the way of the home team as the Eagles came out with the early jump. But 3:18 into the opening frame Daniil Vertiy would put one through the wickets of Eagles netminder William Grimard with a shot from the boards on the left side. Past the halfway mark of the opening period the home team would counter. Mathias Laferrière would circle the net and set up Leon Gawanke for a one timer. Gawanke put it through the legs of Mark Grametbauer but the puck was lying on the goal line. Isiah Campbell was there to tap it in and it was a tie game. 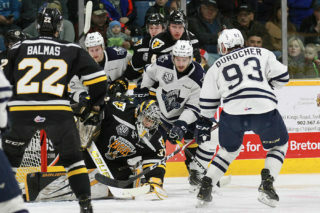 Bathurst would reclaim the lead less than two minutes later, as Marc-André LeCouffe would score from a similar spot at his teammate but this time putting it over the shoulder of Grimard. Not long after the goal though the Eagles would have an ample opportunity to tie the game with a 1:32 minute long two man advantage. In an omen of things to come on the night the Screaming Eagles were unable to score on the power play. However the Eagles were able to find an even strength goal to tie the game before period’s end. 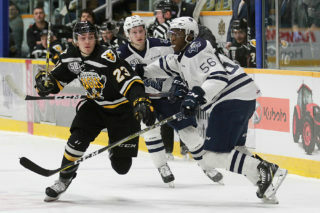 Ian Smallwood, playing as a forward for the first time as an Eagle, jumped into the play in front of the goal and put the puck past the Bathurst netminder and the two clubs were tied at the end of 20 minutes. The same score would hold after 40 minutes as well, with the Eagles holding the Titan to just two shots in the middle stanza but unable to score on any of their 14. In the third period the home side would really fire rubber towards the Bathurst net, putting 23 shots on goal. But it was the visiting side that would find the only goal of the period, in the final four minutes with the two teams playing four on four. Ethan Crossman would move the to puck to Félix-Antoine Drolet, who found Logan Chisholm in front of the goal. Chisholm cut across the slot and put it by Grimard to make it a 3-2 game. 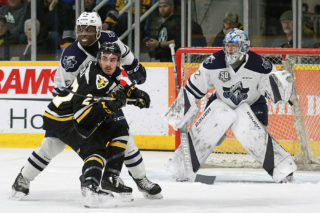 With a little over two minutes left Eagles general manager and head coach Marc-André Dumont would lift his netminder for an extra attacker, but couldn’t find a tying goal as the Titan took the two points on this night. Eagles forward Mitchell Balmas left the game late in the third period after a hit by Crossman, and did not return. Grametbauer picked the win, stopping 52 of 55 shots. Grimard took the loss, allowing three goals on 12 shots.